Ships within 7 business days. Please allow up to 1 additional week transit time for your item to arrive. For Made to Order items, please view the product specifications for additional lead time information. 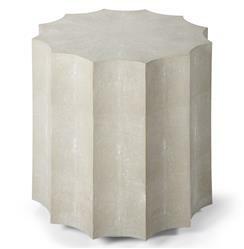 A distinctly sensual, contemporary piece, this faux shagreen scalloped edge end table delivers serious style points alone or in a pair. Pairing modern lines and a lux texture, this ivory beauty is perfect for any modern space.